The better performance of Wall Street supported gains in the pair, in spite of the negative fundamental background. USD/JPY poised to extend gains on a weekly close above 109.05. Following a soft start to the week, the USD/JPY managed to gain ground in the last 4 days, extending gains to fresh January highs in the 109.60 price zone. It was quite a dull week in terms of price action for majors, as speculative interest keeps waiting for answers that don't come. The US government partial shutdown persists, there has been no progress in the US-China trade war, macroeconomic figures keep signaling global economic slowdown, and Brexit, well Brexit is a whole different chapter, but with just 2 months to go, nothing has been solved. Japanese data these days have been quite disappointing, with poor industrial-related figures fueling concern about Japan's economic growth. The US calendar was quite scarce amid the government shutdown that keeps most statistics´ offices closed. The longer the shutdown, the distorted the numbers once they come back. It's going to be messy for sure, and most likely, impact negatively the greenback. Wall Street posted solid gains for a fourth consecutive week, providing support to the pair, as better-than-expected earnings reports from banks and speculation about progress in the China-US trade relation kept the indexes rallying, in spite of the above-mentioned risk factors. US indexes jumped to 1-month highs Thursday following a report suggesting that the US could lift tariffs on Chinese imports, a gesture toward speeding up negotiations and motivating the Asian country to offer further concessions. The news indicated that the idea came from Treasury Secretary Mnuchin, and against US Trade Representative Lighthizer, who see it as a sign of weakness. It was later denied by the Treasury Department, but most correlated assets held on to gains triggered by the headline. US Treasury yields also advanced this week to fresh January highs, as investors prefer riskier assets, although no revolutionary movement was seen in the bonds' market. The upcoming week will kick start with the release of Chinese Q4 GDP, foreseen up 1.5% QoQ and 6.4% YoY, both figures below the final Q3 readings. The country will also release Retail Sales and Industrial Production, all of them to be read by the market as a barometer of economic health. Worse-than-expected readings could fuel the yen on demand for safety. Japan macroeconomic action will start with Wednesday's opening when the country will release December trade data, while the BOJ will present the results of a new monetary policy meeting. The US calendar has little to offer amid the partial shutdown, being the most relevant figure the preliminary January Markit PMIs. Both manufacturing and services indexes are seen slightly below December final readings. 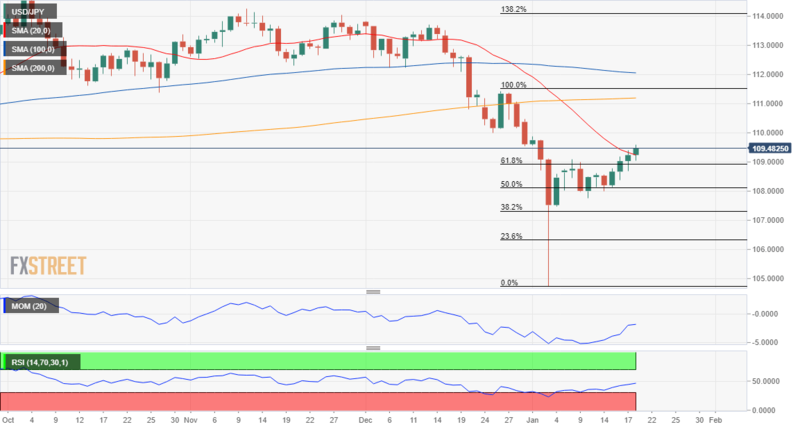 The pair trades above the 61.8% retracement of its 111.41/105.16 decline at 109.05, an encouraging sign for bulls, although the weekly chart shows that the long-term risk remains skewed to the downside, as the price remains well below marginally bearish moving averages, with the 100 SMA being the closest at 111.10. Technical indicators are trying to recover some ground still well into negative ground and with limited strength. In the daily chart, things don't look better for bulls, as only the Momentum indicator entered positive ground, maintaining a strong upward slope, while the RSI advances, but at a slower pace and currently at 48. The 100 and 200 DMA are located over 20 pips above the current level, suggesting that, while the recovery could continue, it doesn't mean the market is bullish. A critical resistance now comes at 110.00 a strong psychological figure, followed by some relevant lows in the 110.45 area. Beyond 111.00, bears could give up and trigger an advance that can extend beyond the top of the range at the mentioned 111.40 price zone. The positive tone will ease sharply if the pair closes the week below 109.05, the mentioned Fibonacci support, with the next ones coming at 108.30, the 50% retracement of the mentioned decline and the 107.60/70 price zone. The FXStreet Forecast Poll indicates that bulls are in control of the pair, being a majority in all the time frames under study. For the upcoming week, the number of those looking for an upward continuation is 59%, decreasing to 43% in the monthly perspective but still being a majority. The pair, however, is seen holding within familiar levels, with an increased buying potential for the end of the quarter, when the average target comes at 111.02. In the Overview chart, moving averages keep recovering after putting in a relevant bottom late December, but remain well below the trend that dominated the second half of 2018, suggesting that interest for the greenback remains subdued due to uncertainty related to the Fed's next steps.